The textile industry is alive and well here in the United States. I’ve spent several days this week with Francisco Sánchez, under secretary for international trade, in North Carolina touring two examples of textile industry manufacturing that represent the broad spectrum of the industry. During the past two years, increased demand for Parkdale’s diverse mix of high quality cotton, cotton blend, and polyester yarns has allowed the company to allocate more than $100 million on capital expenditures, creating nearly 1,500 jobs. Parkdale hosted a unique industry panel of local textile representatives, to share with us the issues facing manufacturing, the importance of innovation for advanced textile manufacturing, and the importance of industry growth in jobs and exports. The industry representatives included Polymer Group International (PGI), Unifi, Inc., Mount Vernon, Frontier Spinning, Pharr Yarns, Hanesbrands, VF Corporation, and the North Carolina Department of Commerce who are all very familiar with the changing face of textile and apparel production here in the United States. Many people may not be aware that the United States is the second largest single country exporter of textiles, with $20 billion in exports in 2010. Businesses that contribute to this volume of exports range from small, family-owned and operated facilities to integrated mills that operate state of the art machinery and production equipment. The textile and apparel industry provides the U.S. economy with a major source of employment and economic activity. The industry is one of the largest employers in the manufacturing sector. Between 2009-2010, the U.S. textile and apparel exports grew 19 percent to $20 billion, and were up 14 percent through November of 2011. 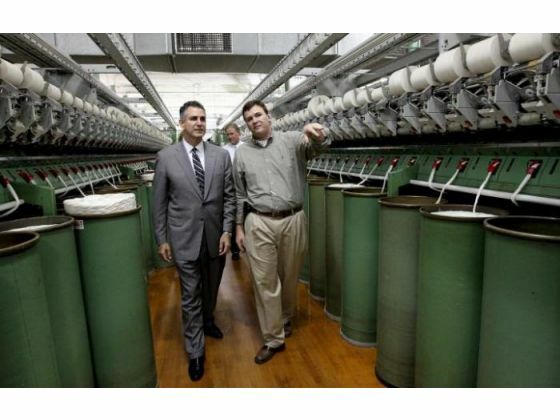 North Carolina in particular has a high concentration of our textile industry. Many global leaders of the industry call North Carolina home. Freudenberg, the world’s largest producer of nonwovens, has two locations in the state, with its North American headquarters in Durham; Kimberly Clark, a vertically integrated manufacturer and converter of nonwoven products for the health and hygiene markets, with two manufacturing facilities; and PGI, one of the world’s leading companies in the hygiene, wipes, medical, industrial, and specialty markets with production operations in four locations in the state, with its headquarters in Charlotte. There are more than 500 performance textile businesses located in 76 out of 100 counties across North Carolina. Performance textiles are fiber-based products that are valued for their technical function and properties as well as their aesthetics. Our second tour was to see the future of textiles at North Carolina State College of Textiles. We toured the labs to see how technical advanced textiles are being used in aerospace, industrial, marine, medical, military, safety, and transportation. The global market for technical textiles was estimated to have a value of $93 billion in 2000 and expected growth is estimated at $127 billion in 2011. There is huge expansion potential for this industry. Advanced textile materials hold great potential for the U.S. textile industry, from textile heart filters, to textile composites used in airplane bodies, to highly flame resistant fabrics and clothing for soldiers, first responders and firemen – the United States is on the leading edge of new and innovative products and materials. North Carolina State University’s College of Textiles “Centennial Campus”, is home to university colleges, departments, and research labs and also home to 61 industry and government partners who work with the university each day. These partners are fully integrated into the university, working with faculty, students and staff. Founded 113 years ago, the College of Textiles is the leading institution of its type with more than 2,000 graduate and undergraduate students. It was a privilege to see both Parkdale Mills and the College of Textiles Centennial Campus in action. Meeting the students who are developing the future of the textile industry right here in North Carolina was a highlight of the trip. The current state of the textile industry is miles ahead of where it began and I look forward to the new innovations we will see in the near future.